The Portland Oregon Temple is the 42nd operating temple of The Church of Jesus Christ of Latter-day Saints. 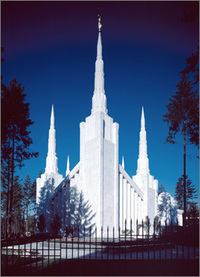 The Oregon temple sits on 7 acres of lush green land in Lake Owego, Oregon. The temple has six white spires and a white marble exterior accented with green marble trim and topped with a green slate roof. The three east spires on the temple represent the Melchezidek Priesthood and the three west spires represent the Aaronic Priesthood. The Portland Oregon Temple has a total of 79,220 square feet, four ordinance rooms, and fourteen sealing rooms. On February 25, 2012, The Church of Jesus Christ of Latter-day Saints opened a new visitors' center adjacent to the Portland Oregon Temple. The visitors' center is the new version of a building near the Portland Oregon Temple formerly used as a Church Distribution Center. The key messages of the new visitors' center pertain to Jesus Christ, blessings of the restored gospel and temples and eternal families. The new visitors' center contains copy of Danish sculptor Bertel Thorvaldsen's Christus Statue, copies of which are in the Temple Square North Visitors' Center and other Church visitors' centers. There is also a mural of a sunrise over the local landscape, an exhibit explaining the history of the Portland Oregon Temple, an exhibit explaining temples and how they bless families, and an exhibit featuring real Mormons bearing witness of Christ. A new interactive exhibit introduces visitors to the Book of Mormon and its teachings. There is also an exhibit on Jesus Christ as the Savior of the world. It features a Biblical setting where visitors can learn about who Jesus is, where He walked and what He taught. Another exhibit includes the testimonies of the First Presidency and members of the Quorum of the Twelve. Also included are teachings from recent general conference addresses. There is also a theater that offers a new presentation titled "God's Plan and His Family" along with other favorite films shown at other Church visitors' centers. This page was last edited on 29 November 2015, at 19:41.